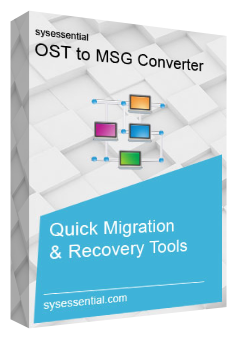 Sysessential for OST to MSG is the complete software when it comes to migrate whole data from OST files into MSG file format. Free download edition is an added benefit. It is worth to check the features and working process through free of cost evaluation edition. If you have bulk of OST files to be transferred into MSG then also software consumes only few minutes in completing email migration process. Thus if you are a true professional and want instant email migration done then this application will best suit to your needs. Thus investing in such a utility will bring long term benefits. Just like it is supportive of all Outlook versions, the applications works seamlessly with all MS® Exchange and Windows editions. Thus no specific edition prevents you from utilizing the tool. Brilliance in the application instilled in the features from tip to toe. This versatile software application supports converting damaged OST files in MSG. No matter what is the prime reason behind OST file damage including MS Exchange server damage, synchronization issues, networking connection damage, power failure etc. Software supports all these reasons for migrating damaged OST files in single file format of Outlook i.e. MSG. Tool ensures for keeping header part, hyperlinks etc as it is while making export of OST in MSG. It is obvious that prior buying the application in fully operable mode, user have curiosity to test the software’s functions and working process. In all these scenarios, simply download the application in free of cost trial edition and check out application really works Free trial run will let you evaluate in deep about the tool. It will show you the complete functioning by converting first 10 emails from every OST item. Is software comfortable to work with all Outlook, Exchange and Windows versions? Yes, software developers have made it a point that application should be capable enough to work with all Windows, Outlook and MS Exchange versions rather than support working with few specific editions. Thus version restriction is no more applicable with the tool. Will software export bulk OST files in few minutes? Will Metadata Info remains same even after migration? What are expectations with free trial run? You can expect much higher from free of cost trial edition of Sysessential for OST to MSG Converter application. It is the utility that supports migrating emails without causing data loss. If you want to take a test drive and wanted to investigate on the personal level then click Download Now button and fetch the entire functioning smoothly. This will give fair idea regarding features and working procedure. The free trial mode will show the migration of first 10 emails from evry item of OST file into MSG file format. After download the software in free demo edition if you are clear about features and functioning then make a purchase of the application in fully operable edition. In this connection, get connected with the support guys and they will clear out what you are required to do in this connection. They will let you know about the apt payment option and so on. Support tea, is fully supportive and available for 24 into 7, so not to worry at all. I really fall into the need of migrating OST files into MSG for keeping data as backup. But I failed to make up with manual method reason being, I have bulk data for migration. In such a scenario, I thought to purchase some professional application and then finalized for Sysessential for OST to MSG tool. This tool migrated complete OST files into MSG and today I am happy with the received data. This is quite embarrassing when it is to migrate OST files into MSG and you are clueless where to attain help from. In such a situation, I tried using Sysessential for OST to MSG too in freeware demo edition. After completely understanding the features and functioning, I purchased the tool in fully operable mode and now happily working with data. The purchase formality was simple and systematic. Thanks support team for complete guidance.